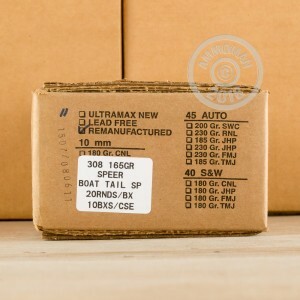 If you are looking for a great, long range round with low ammo cost and and lower recoil, then the 308 is the round for you. With high power, a small kick, and great accuracy, this round is perfect for hunting, self defense, match shooting, and range training. Ultramax is a fairly new company, but in their few decades of business, they have managed to spread their product across the entire United States. 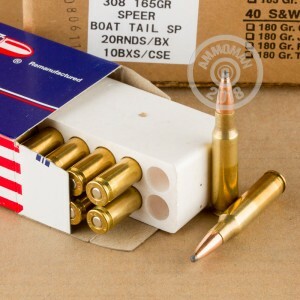 With these high quality, all American rounds, you have just what you need to have a successful hunting trip. 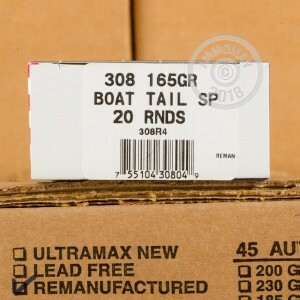 These 165 grain, boat tailed soft point rounds have the increased accuracy and range, flat trajectory, and expansion to take down elk, deer, and boar.